We have seen close to 50 tablet launches in India, and I see that one after the other seems to fail on at least one thing or the other. Though we provide commentary on tablets which these companies work hard to bring to market, it is sad to notice and mention the same mistakes the tablet makers continue to make. While we understand that the tablets being launched can’t be compared with iPad, it doesn’t hurt to try and come as a close second. For someone who is a manufacturer and happens to read this blog, you are just in luck because I have compiled a list for you. 4 Take a vow, say no Android 2.2! 5 Do something about the content. Will Ya? Cheap in price doesn’t mean cheap in features or cheap user experience. Resistive touch screens weren’t even cool on camcorders. So why bring them to Tablets which have the screen as the sole input? If you can’t bring capacitive touch screen tablet, you are better off not bringing any tablet at all. Enough said. We have seen brands launching tablets with 3G dongles. That only tells one thing of that brand : They didn’t care much about the product. Tablet by definition is extremely mobile device which is always connected. There are two famous connectivity options – 3G and WiFi. 3G is wireless and mobile. WiFi wireless but limited to a range. 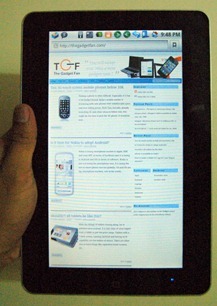 If you are trying to sell a tablet then sell it with 3G. As for dongles, let me ask you this : ‘dongle’ as a word does it even sound good to you? Fat bodies and wide bezels doesn’t make a tablet. They just make the tablet look like the latest transistor, which by the way are museum artifacts right now. So why go through evolution? And don’t be ashamed to get little inspired by popular tablets like iPad. There’s no fun in making things fat and big unless of course if you are in the implants business. Take all these tablets, find a famous doctor and put them through liposuction. It is working for India’s movie stars. Take a vow, say no Android 2.2! Launching tablets with Android 2.2 is tantamount to smoking cigarettes in public places. I know everyone ignores the law and continue to smoke in public places but that’s how things happen in a civilized democratic world. Gadget world is rather autocratic with customers as the sole dictators. If the customer feels that they don’t want Android 2.2, then you as a tablet manufacturer are doomed. So why go through the trouble launching a tablet with Android 2.2, then go in to a war room to discuss what went wrong? Do something about the content. Will Ya? Tablets are good and tablets with content are even better. And tablet without content are like guns without bullets. There is a whole bullet manufacturing ecosystem we call the app stores but they are not scaling up as fast as market wants them to. If you want your tablets to sell well, get creative, fund developers and launch tablets with some useful apps. Huawei said it will launch tablets with India focused content. I was happy when that news came out. It is 3 months now. Where are we with these Huawei tablets? There is a theory about Apple’s product strategy. Whatever testing that has to go on, goes on in Apple itself. Apple never uses the market to test its products. Apple might have tried more than 5 different sizes for iPad to come with what we have now. When it comes to Android tablets, the reverse is true. The first design to come out of engineers room is sent to the production line. Stop doing this. True. But when 3G becomes affordable, the tablet cannot be used to access 3G services. I remember, 3G phones were launched in India before 3G was available beyond BSNL+MTNL. Why launch a tablet without 3G?